There are many opportunities for students to get involved Tufts sustainability initiatives. Students on all of Tufts' campuses in Somerville/Medford, Grafton, and Boston engage in sustainability in a variety of ways. Click on any of the buttons below for details, or read the descriptions below for an overview. In our outreach efforts to students, we help develop leadership skills in students who come with a passion for the environment. We also help foster awareness and knowledge among the general student body. The Office of Sustainability (OOS) regularly offers internships for graduate and undergraduate students. Information will be posted to our website and social media channels when openings are available. Email sustainabilityoffice@tufts.edu for more information. The OOS also offers the opportunity for student research projects. Please e-mail tina.woolston@tufts.edu to inquire about student research projects. The Tufts Eco-Reps are a group of residential students paid by the Office of Sustainability. They help to raise awareness about ecological issues, encourage environmentally responsible behavior in their hall-mates and peers, and plan green-related events and activities. 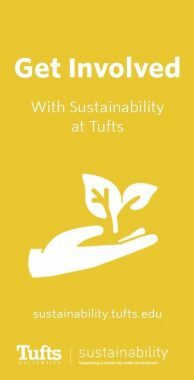 There are many student organizations at Tufts that focus on sustainability and other related issues. The Green House is a 10-person special interest housing unit for students interested in sustainability. Its residents participate in environmental groups on campus and complete sustainability-related projects. The Green House also organizes an annual back-to-school sale of items that were left behind by students in the previous year. The funds from the sale help residents of the Green House put on various sustainability-themed events and other initiatives throughout the year. Tufts University has a longstanding commitment to deepen and broaden environmental literacy of its students. Each semester, the university offers several courses in science, policy, economics, and engineering focused specifically on sustainability-related issues. The Office of Sustainability works closely with several faculty members to introduce climate change and sustainability into their curriculum.